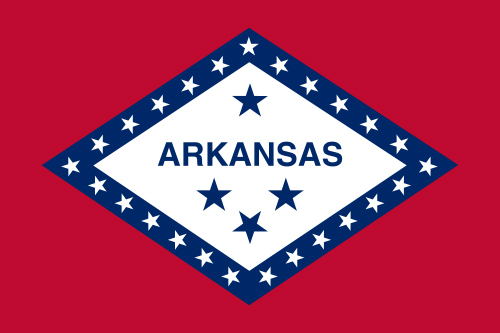 Flag of Arkansas (public domain image on Wikipedia). In 1912 the battleship Arkansas was to be commissioned, and the Pine Bluff chapter of The Daughters of the American Revolution (DAR) promised to present the ship with an Arkansas state flag for the occasion. However, when they wrote to the Secretary of State to learn more about the flag, he replied that Arkansas had no State flag! The DAR went into action and held a contest in Arkansas for a state flag design. Miss Willie Hocker from Wabbaseka, AR submitted the winning entry (the Confederate star was not part of this original design, but added later by legislature).